At my standard 5'11 in height and UK dress size 8 I'm used to being slim and the only thing that has ever stuck out is my larger-than-average chest area. When I got married I weighed just under 8 stone (stress not dieting - weddings are not for the faint-hearted!) but generally I weigh about 8.5 - 9 stone max. So imagine my suprise when, almost 5 months into my pregnancy, not only is my belly quickly expanding but my face is also getting fatter and rounder! I know that might sound like an exaggeration but I truly am now the not-so-proud owner of a fat face. Now I know what my colleague saw when, sitting at my desk 10 weeks in and still trying to keep it on the down-low at work, she stopped in the doorway, looked properly at my face and said "Are you pregnant??" Weight gain is something I never gave much thought to in the early stages when my bump was small and cute but this sudden and unexpected growth has initially been quite traumatising. My friends and family seem to find it quite funny. My husband laughs at me when I'm getting dressed in the morning and says I look like an elongated S-shape. My boss says she can't wait til I start waddling to work and when I asked my friend to help me tighten the bracelet she bought me for my birthday she said I shouldn't bother as my wrists will get fat soon anyway so she won't have to. Luckily for me, strangers seem to think I've 'still got it'. Several times during the first week of the London Olympics I was asked if I was an athlete. This, despite my rather obvious protruding black vest clad belly over my lycra leggings. 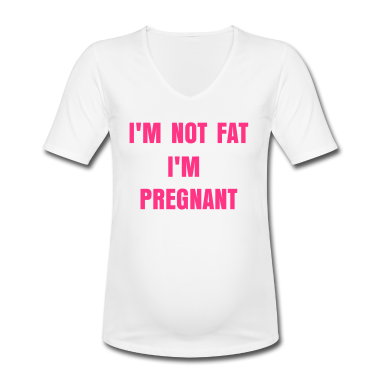 I guess its true that black is slimming but I'm not sure the preggers relay has been invented yet. I'm just saying. This baby has alot to answer for. It's hard, isn't it, to suddenly not have something that you're used to and take for granted. But we always learn something during times like this, and at least it's for an extremely wonderful reason! I try to really appreciate my smooth, flat stomach in particular, because one day (God willing) it will be crepey and covered in stretch marks! Loving the expression maternal storage tissue! Classic. P.s you look gorgeous as always!